Download "Art Institute Intellectual Property Policy (MAY 2013)"
1 I. Purpose or Scope Art Institute Intellectual Property Policy (MAY 2013) The unauthorized distribution of copyrighted material, including unauthorized peer-to-peer file sharing, may subject students and individuals to civil and criminal liabilities. Almost all of the music, movies, television shows, software, games and images found on the Internet are protected by federal copyright law. The owner of the copyright in these works has the right to control their distribution, modification, reproduction, public display and public performance. It is therefore generally illegal to use file sharing networks to download and share copyrighted works without the copyright owner s permission unless fair use or another exemption under copyright law applies. Fair use under the federal Copyright Act allows the use without permission of copyrighted material for the purpose of criticism, comment, news reporting or teaching under certain limited circumstances. There is no blanket exception from liability for students or employees of educational university, however, and whether the use of copyrighted material without permission falls with fair use or one of the other exceptions in the Act depends on a very detailed, case-by-case analysis of various factors. Students should be aware that sharing music, videos, software and other copyrighted materials is very likely not to be considered a fair use and therefore may be a violation of the law. 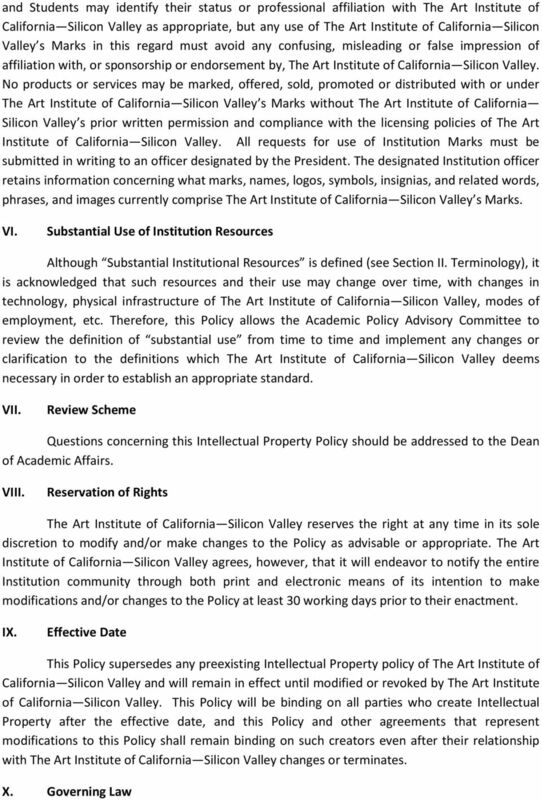 A violation of The Art Institute of California Silicon Valley, a campus of Argosy University s policy for use of its information technology system can result in termination of network access for the student and/or other disciplinary action including removal of the student from The Art Institute of California Silicon Valley. Summary of Civil and Criminal Penalties for Violation of Federal Copyright Laws Copyright infringement is the act of exercising, without permission or legal authority, one or more of the exclusive rights granted to the copyright owner under section 106 of the Copyright Act (Title 17 of the United States Code). These rights include the right to reproduce or distribute a copyrighted work. In the file-sharing context, downloading or uploading substantial parts of a copyrighted work without authority constitutes an infringement. Penalties for copyright infringement include civil and criminal penalties. In general, anyone found liable for civil copyright infringement may be ordered to pay either actual damages or statutory damages affixed at not less than $750 and not more than $30,000 per work infringed. For willful infringement, a court may award up to $150,000 per work infringed. A court can, in its discretion, also assess costs and attorneys fees. For details, see Title 17, United States Code, Sections 504, 505. Willful copyright infringement can also result in criminal penalties, including imprisonment of up to five years and fines of up to $250,000 per offense. For more information, please see the website of the U.S. Copyright Office at The Art Institute of California Silicon Valley s policies in regard to copyright infringement via the Internet prohibit the illegal downloading or unauthorized distribution of copyrighted materials using The Art Institute of California Silicon Valley s information technology system. 4 commonly provided, is considered a use of Substantial Institutional Resources. This use does not include resources commonly provided to Institution faculty and staff, such as offices, library facilities, basic artistic facilities, and everyday telephone, computer, and computer network support. However, substantial time spent in the use of these latter resources may constitute the use of Substantial Institutional Resources. Resources not considered commonly provided include specially procured equipment or space, additional staffing or personnel, utilization beyond normal work hours of Institution personnel, and monetary expenditures that require a budget. Faculty may use the basic artistic facilities unless use infringes on student use of those facilities for coursework. J. Trademark and Service Mark - A trademark or service mark is any word, phrase, name, symbol, logo, slogan, device, or any combination thereof that is used in trade to identify and distinguish one party s goods or services from those of others. K. Work - The term Work as used in this Policy shall be defined to include all of the items identified in Sections (i), (ii), (iv) and (v) of the definition of Intellectual Property in paragraph E. L. Work Made for Hire - A Work Made for Hire is defined as a Work (as defined in paragraph K) prepared by an employee within the scope of his or her employment. Consistent with the Copyright Act of 1976, as amended, a Work Made for Hire under this Policy also includes a work specially ordered or commissioned for use as a contribution to a collective work, as a part of a motion picture or other audiovisual work, as a translation, as a supplementary work, as a compilation, as an instructional text, as a test, as answer material for a test, or as an atlas, if the parties expressly agree in a written instrument signed by them that the work shall be considered a work made for hire. 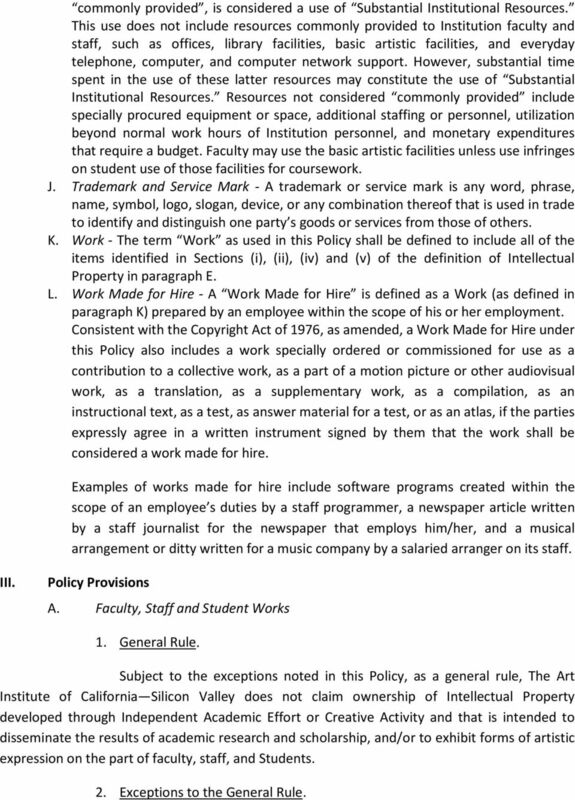 Examples of works made for hire include software programs created within the scope of an employee s duties by a staff programmer, a newspaper article written by a staff journalist for the newspaper that employs him/her, and a musical arrangement or ditty written for a music company by a salaried arranger on its staff. III. Policy Provisions A. Faculty, Staff and Student Works 1. General Rule. 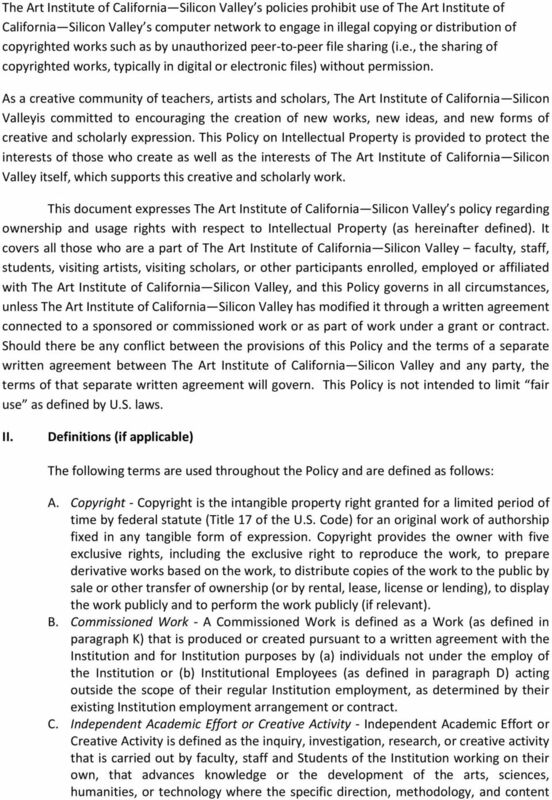 Subject to the exceptions noted in this Policy, as a general rule, The Art Institute of California Silicon Valley does not claim ownership of Intellectual Property developed through Independent Academic Effort or Creative Activity and that is intended to disseminate the results of academic research and scholarship, and/or to exhibit forms of artistic expression on the part of faculty, staff, and Students. 2. Exceptions to the General Rule. 5 Exceptions to the general rule set forth in III.A.1 above include Intellectual Property developed by faculty, staff, Students and Institutional Employees under any of the following circumstances: (a) The Intellectual Property is developed as a Sponsored Work. (b) The Intellectual Property is developed as a Commissioned Work. Resources. (c) The Intellectual Property is developed using Substantial Institutional (d) The Intellectual Property is developed by the creator within the scope of his or her employment with The Art Institute of California Silicon Valley and constitutes a Work Made for Hire. (e) The Intellectual Property is developed by a creator who is assigned, directed or funded by The Art Institute of California Silicon Valley to create the Intellectual Property. 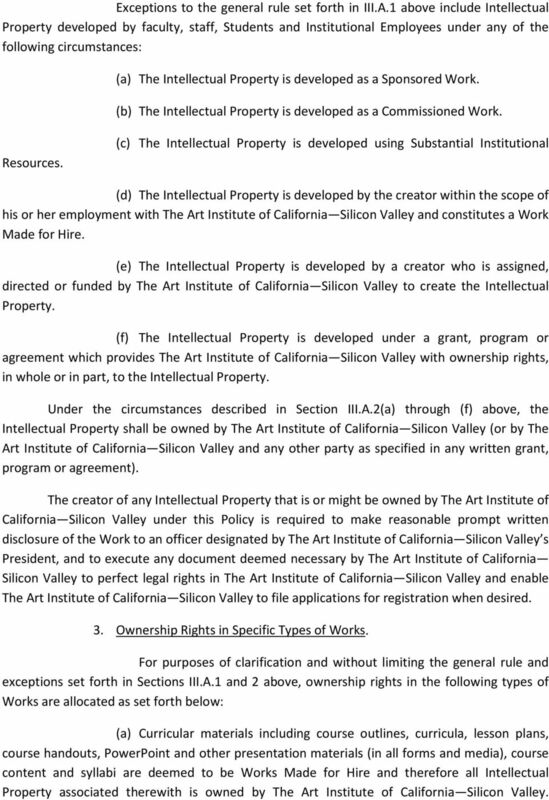 (f) The Intellectual Property is developed under a grant, program or agreement which provides The Art Institute of California Silicon Valley with ownership rights, in whole or in part, to the Intellectual Property. 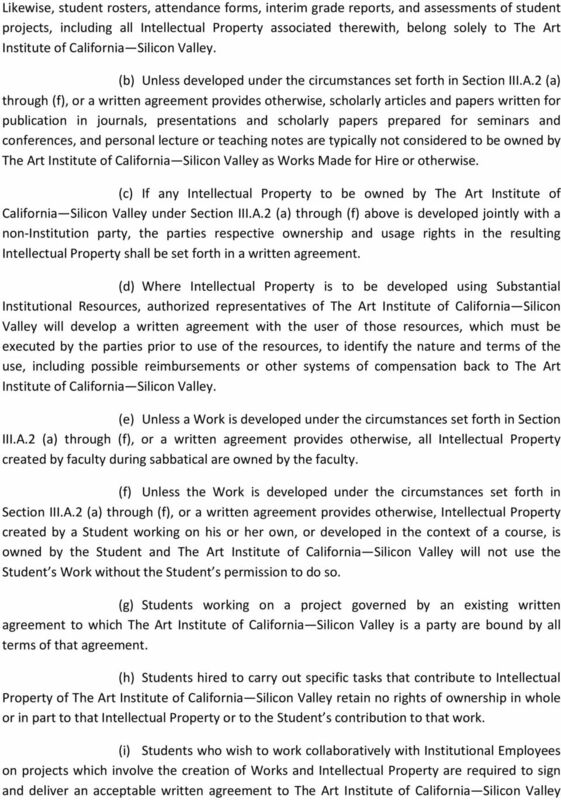 Under the circumstances described in Section III.A.2(a) through (f) above, the Intellectual Property shall be owned by The Art Institute of California Silicon Valley (or by The Art Institute of California Silicon Valley and any other party as specified in any written grant, program or agreement). 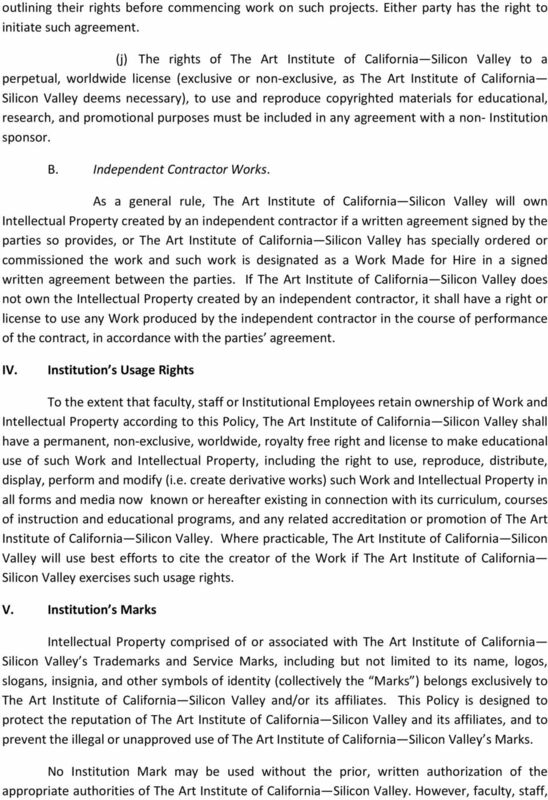 The creator of any Intellectual Property that is or might be owned by The Art Institute of California Silicon Valley under this Policy is required to make reasonable prompt written disclosure of the Work to an officer designated by The Art Institute of California Silicon Valley s President, and to execute any document deemed necessary by The Art Institute of California Silicon Valley to perfect legal rights in The Art Institute of California Silicon Valley and enable The Art Institute of California Silicon Valley to file applications for registration when desired. 3. Ownership Rights in Specific Types of Works. For purposes of clarification and without limiting the general rule and exceptions set forth in Sections III.A.1 and 2 above, ownership rights in the following types of Works are allocated as set forth below: (a) Curricular materials including course outlines, curricula, lesson plans, course handouts, PowerPoint and other presentation materials (in all forms and media), course content and syllabi are deemed to be Works Made for Hire and therefore all Intellectual Property associated therewith is owned by The Art Institute of California Silicon Valley. 9 This Policy shall be governed by and interpreted under applicable federal laws pertaining to intellectual property and applicable state law, without regard to choice of law provisions. UCO Copyright Compliance Starting Point for Al Copyright Concerns: 1. Is the work Copyrighted? 2. Is the class traditional or Online? BUSINESS SERVICES COPYRIGHT OWNERSHIP/INTELLECTUAL PROPERTY CHAPTER 2 Board of Trustees Approval: 09/11/2013 POLICY 12. UNLV Intellectual Property Policy 1. Preamble 2. Definitions 3. Ownership of Intellectual Property 4. Inventions 5. Copyrighted Works 6. Administration 7. Distribution of Income Section 1. Preamble 1. 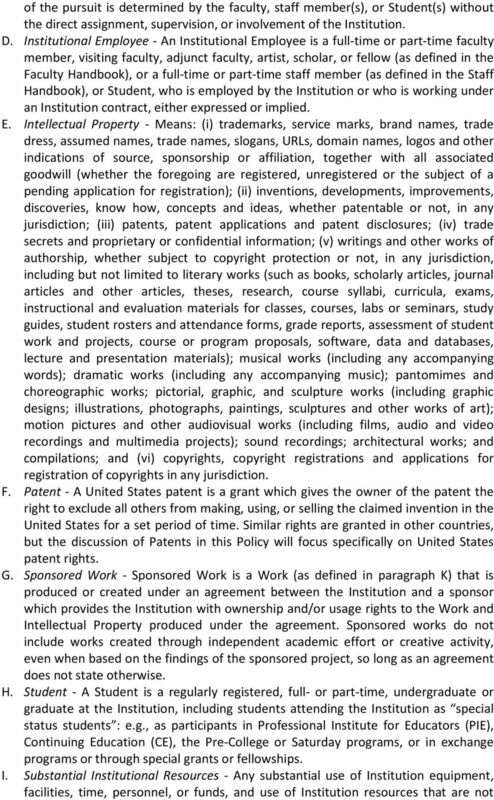 COPYRIGHT USE AND OWNERSHIP POLICY OF WINSTON-SALEM STATE UNIVERSITY I. PREAMBLE. Winston Salem State University (WSSU) is committed to complying with all applicable laws regarding copyright and patents. MEMORANDUM ON COPYRIGHT LAW AND COMPLIANCE As educators, authors and creators of copyrightable works, members of the University community have a duty to respect the copyright interests of third parties. 1. How are intellectual property, copyright and related terms defined in Canadian law and at Ryerson? COPYRIGHT POLICY 500 LEARNERS AND ACADEMIC PRACTICES Policy Statement Copyright is the right to reproduce in any form a work or parts of a work, to perform in public, or to publish an unpublished work. Page 1 6-908 Intellectual Property Policy The Arizona Board of Regents, and the three universities which the Board governs, are all dedicated to teaching, research, and extension of knowledge to the public. SCOPE: This policy applies to all members of the College community, including students, faculty, staff, contractors and volunteers. Last updated June 16, 2016. Replaces the January 20, 2016 version in its entirety.